A growing number of bicycling enthusiasts in Chicago are raising serious complaints about vehicles obstructing their protected bike lanes. Now they are sharing images of blocked bike lanes with the world to show how risky their rides can be each day. "It’s very hazardous for us to have to pop out into traffic all of a sudden when a vehicle is in front of us," said bike commuter Cheryl Zalenski. City law prohibits driving, idling and parking in bike lanes, but on any given day in the Chicago Loop, you’ll see a vehicle obstructing them. Cab driver Gary Karczewski said sometimes he has no other choice but to pull in to a bike lane to assist passengers. "You get somebody old or disabled, you’ve got to help them out of the cab or in to the cab," Karczewski said. "Between the buses, the bikes and the cabs, it can get really crazy out here." 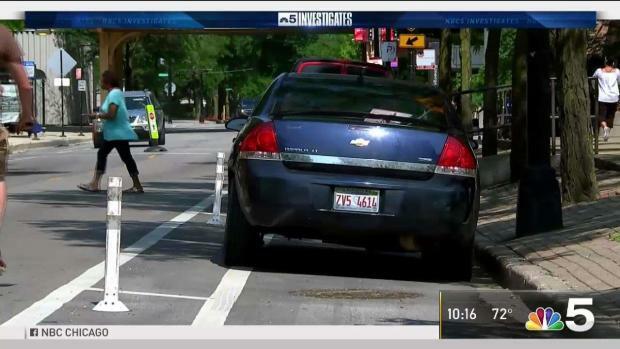 NBC 5 Investigates took a 30-minute bike ride through the Chicago Loop and came upon 18 partial or full bike lane obstructions. Christina Whitehouse founded a website that displays blocked bike lanes across Chicago after she said a truck entered her bike lane two years ago. When members submit photos of obstructed bike lanes to BikeLaneUprising.com, it allows Whitehouse to create maps to visualize hotspots across the city. "Who are the repeat offenders? We can see license plates that are showing up more than once," Whitehouse said. Private owner vehicles, rideshare cars, taxis, postal trucks and delivery trucks are complained about the most in Chicago, according to Whitehouse. Her data shows the three most problematic areas for bike lanes include the Loop along Franklin Street, the UIC Medical District, and Harrison Street between the Greyhound bus station and the Main Post office. Whitehouse said she shares her research with city officials and companies to raise awareness of the issue. "No one solution is going to solve this," Whitehouse said. "I think we need to chip away at it from an education standpoint. Maybe some of those people don’t know where the bike lane is. Maybe it’s not clearly marked." The city issued 3,460 tickets for blocked bike lanes in 2017. That’s up from 2,766 the year before. The fine for violations is $150 and if the fine isn’t paid within 30 days, it doubles to $300. But some cyclists said the ticketing is not keeping up with the violations they see. "It would be even better if they would put signage up to let drivers know that it’s illegal to be in the bike lane and then to enforce the ordinance that’s in place," Zalenski said. A growing number of bicycling enthusiasts in Chicago are raising serious complaints about vehicles obstructing their protected bike lanes. Now they are sharing images of blocked bike lanes with the world to show how risky their rides can be each day. Chris Coffey reports. Chicago has more than 200 miles of on-street bikeways and prides itself as one of the most bike-friendly cities in the country. A spokesperson for the city’s Department of Transportation said Chicago is focused on building a culture of traffic safety. Additionally, the city said it is upgrading protected bike lanes on Milwaukee, Elston and Dearborn with concrete curbs to "better define parking lanes and to provide increased separation between people biking and driving." The Active Transportation Alliance, through its Clear the Way campaign, said it has worked to draw attention to the issue and push the city to do more to address the problem. "We were pleased a first step was taken by updating the city’s 311 system to include a dedicated code for blocked bike lanes, which will help identify hot spots for targeted enforcement," said managing director of advocacy Jim Merrell. A city spokesperson said there were 1,452 calls to 311 for "vehicles in bike lanes" in 2017 and there have been 1,269 calls so far in 2018. According to the Illinois Trucking Association, bicycle lanes can create a new safety challenge as delivery and service vehicles may have to park further away from the sidewalk. "The Illinois Trucking Association’s top priority is safety; safety for our drivers as well as the motorists, bicyclists and pedestrians with whom we share the road,"said executive director Matt Hart. The United States Postal Service said in the course of delivering mail daily to the more than 1.2 million delivery points in the city of Chicago, access to parking can be difficult in some neighborhoods. A spokesperson said USPS policy is for employees to adhere to all traffic laws and they should not park in bike lanes. A spokesperson for Cab Drivers United/AFSCME Local 2500 said everyone can safely coexist on our streets if everyone follows the rules.